This company has a fast paced work environment that focuses on giving great customer service. Most store locations outside of Denver, CO are franchise owned and you must apply in person. 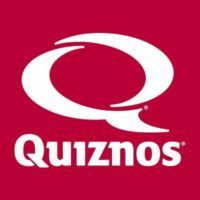 There is a link provided under Job Links to download a printable application for Quiznos. However, if you are in the Denver area and would like to search for Quiznos jobs, there is a link to fill out a Quiznos application online as well. The restaurant chain began in 1981 by Jimmy Lambatos in Denver, CO. The company offered its first franchise in 1983. In 1991, Mr. Lambatos sold the company to Rick and Richard Schaden. Currently, the chain has around 2100 stores located mostly in the US and Canada with around 600 international locations. The Headquarters are located in Denver, CO. The company wanted to be a different type of sub shop. They have master chefs that create their soups, salads, and sandwich recipes. From the very beginning they have toasted their sandwiches, setting them apart from other companies. They also believe in uncompromising quality and that the customer’s order should be made exactly how the customer wants it. There are many franchise opportunities available for the entrepreneur-minded person. For more information and how to apply for Quiznos franchises, there is a link at the bottom. Whether you want to work in a company or franchise owned restaurant, there are a couple of Quiznos jobs to choose from. The restaurant has positions such as crew member, Shift Manager, and General Manager. The corporate office careers are a bit harder to find as they are not advertised on the Quiznos website. Such positions include Global Chief Operations Officer, Social Media and Digital Marketing, and Senior Financial Analyst. A link has been provided for each of these exciting Quiznos careers. How old do you have to be to work at Quiznos? All team members must be able to work nights, weekends, and holidays. Due to this type of schedule, the minimum age requirement is 18 years old. Quiznos offers its eligible corporate employees, those who work in a company owned store or for the corporate office, a great benefits package. Some of the benefits include medical, dental, and vision insurance, profit sharing plan, vacation and sick pay, as well as short term and long term disability. Benefits vary in the franchise owned stores and you will need to ask what benefits are available. This company looks for people who are honest, reliable and fun, as well as being customer centric. They boast a culture that is unique, fun, challenging, and friendly. If this matches your personality and personal values, fill out the Quiznos application either by searching for Quiznos jobs online or by going into your local store to apply for jobs at Quiznos directly. Store hours vary with each location, so make sure you call ahead of time. Crew Member – This position has a variety of duties including greeting and serving the customers, process the customers’ orders, and food preparation. Other duties include maintaining overall store cleanliness, providing excellent customer service, and following all food safety and sanitation guidelines. Assistant Manager –The Assistant Manager position must have previous restaurant experience, have demonstrated the ability to manage a team and have the ability to work under pressure. Some responsibilities include monitoring the team’s daily performance, quality of products and food safety handling procedures. This role will also have the critical thinking skills required to overcome and satisfy customers’ needs. General Manager – The General Manager is responsible for providing leadership to team members, delivering restaurant goals by maintaining labor, food, and paper cost, and completing weekly inventories. Other duties include completing weekly schedules, coaching and training team members, and assisting team members where needed. The listed interview questions are typical of those found in the restaurant industry. What is your experience in food preparation? Keep in mind that Quiznos is a fast paced restaurant that must follow food safety standards. What are you 3 best talents or behaviors? This question is similar to asking you what your three greatest strengths are. What would you do if you received a difficult customer? In any customer service oriented business, you will have difficult customers. Think about the last time that you were the upset customer and how the customer service person treated you and how you would have liked to be treated. Can you memorize the menu? Many restaurants require the memorization of the menu in order to better assist the customer. If you are not sure, suggest that you could start working on it as soon as you are hired instead of saying no or saying that you don’t know. What kind of leadership skills do you possess? This is a question that is asked more for a management position or because the interviewer is looking for someone that they can develop into a manager. If you have never had a management position before, use other examples of how your leadership skills came shining through. When applying in person, fill out the application completely and legibly. Make sure you dress as if you are going for an interview including business casual attire, minimal makeup and clean shaven. Many restaurants will give you and interview at the time that you submit the application. Show that you are prepared and submit your resume with your application. If applying online, give yourself plenty of time to fill out the interview as there may a personality or self-assessment test. Before the interview, research more questions that the interviewer might ask and think about how to answer them. This is also a good time to research the company, its’ values, and culture. Write down some additional questions regarding the company to ask your interviewer. Arrive to the interview on time, if not five or ten minutes early. Notify the person at the counter that you have an interview, what time the interview is at, and who the interview is with. Be sure to smile, keep eye contact, and be friendly towards the hiring manager. This gives you an air of confidence that other people interviewing for the job may not have. Try to avoid spending too much time on one question; keep your answers short and concise. When you are giving examples, focus on your previous experience. At the conclusion of the interview, be sure to ask when you will have a follow up and show your gratitude to the hiring manager.